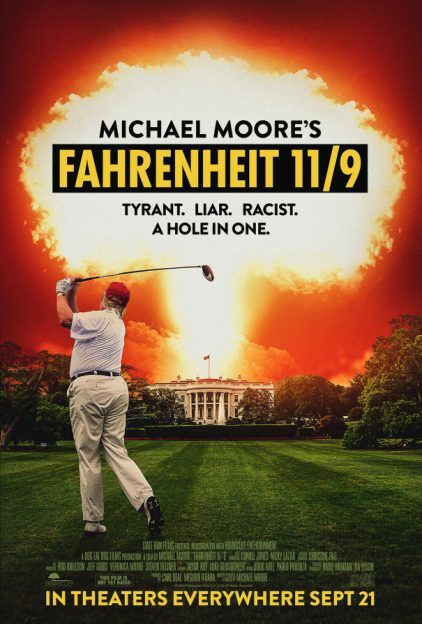 The new poster for Michael Moore’s upcoming Fahrenheit 11/9 doesn’t mince words and appears to be designed to spread the leftist view of President Trump. Trump golfs with his MAGA hat on and swings towards the White House under a mushroom cloud. Moore is tapping into to the political fervor for the midterms, premiering the film at next month’s 2018 Toronto Film Festival. Moore also described Trump as “the last president of the United States” and includes footage of Trump rallies and neo-Nazi protests. He began shooting the film last year with the “11/9” in the title referring to the day Trump was declared President of the United States on Nov. 9, 2016. Fahrenheit 11/9 opens wide on September 21.